In 1964, while in Rome at the Second Vatican Council more than 2000 bishops discussed the future of the Catholic Church, the scholar of communication Marshall McLuhan published what should become his most well-known book: „Understanding Media“. In his book, McLuhan argues for a stronger focus on the media themselves instead of focusing primarily on media content and coined the famous phrase: „The medium is the message.“ More than the particular media content, so McLuhan, it is the characteristics of the media itself – their materiality and modes of function – that would shape the ways we perceive the world and ourselves and the ways we organize ourselves socially and culturally. At the Second Vatican Council, too, the bishops discussed questions of media and media change. The discussions were based on the assumption that the church can and should make use of modern mass media – then radio, film, television and the journalistic media landscape – to share the goods news of the gospel. The World Communication Day, instituted in the aftermath of the Council, bears testimony to these discussions.Much has happened since then. Today, Pope Francis is posting on Instagram and communicates via Twitter in nine different languages to more than 25 million followers. Both the bible and the book of hours are available as smartphone applications and interested parties may inform themselves about the Christian faith on websites like katholisch-werden.de („becoming-Catholic.de“). Against this background, the upcoming conference sets out to explore the role and meaning of media and media change within the history of Christianity from an interdisciplinary and global perspective. 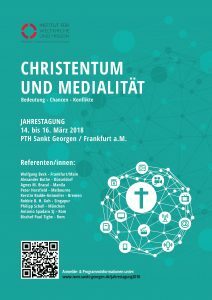 How to conceptualize the mutually constitutive relationship between media and processes of mediation on the one hand and Christian discourses, practices, modes of percepetion and socialization on the other? And how to assess and evaluate latest developments within the „digital era“ from a missiological perspective? In the first part of the conference, we want to prepare the ground with a theoretical introduction on the subject of religion, media and processes of mediation and explore the topic through case examples from the history of Christianity. The second part will be dedicated to a discussion of contemporary case examples from different parts of the world, especially taking into consideration Pentecostal, charismatic and evangelical forms of Christianity in relation to their utilization of media and processes of mediation. The last part of the conference will be dedicated to an assessment of latest developments within the field of global Christianity from a missiological perspective. Conference languages are German and English. Simultaneous translation will be provided. Please take not, overnight accommodation is not included in the conference fee and has to be organised by the participants themselves.